This is our little friend Skippy (we think), but it looks like we will have to give him a new nickname, Peter Peter Pumpkin Eater. 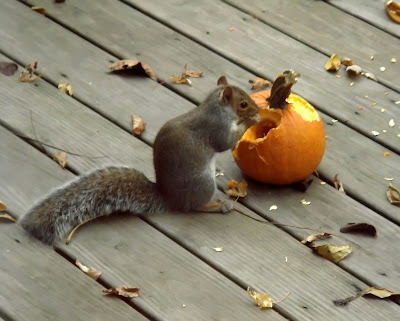 The past two Halloweens, he has come trick-or-treating at our back door for peanuts, but it looks like we have a new tradition to keep up with now, pumpkin for the squirrels. Even little Skippy knows how yummy pumpkin is. He must know it's chock full of vitamins too.